2018, is the third anniversary of the Rich Art Gallery. 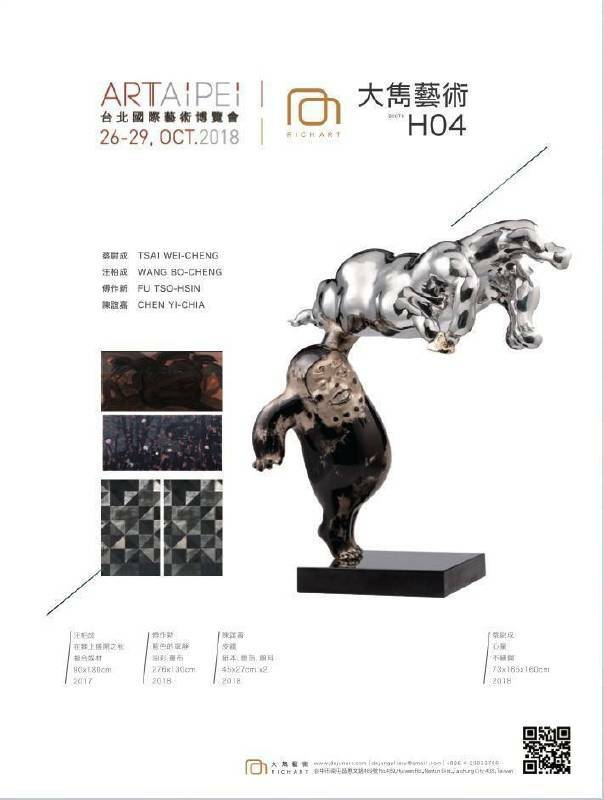 We bring Taiwanese artists together to participate in contemporary artists international expos, such as La Biennale di Venezia (GAA FOUNATION, 2017), Art Stage Singapore (2016-2018), Art Fair Tokyo (2016) Art Beijing (2017-2018) and many other international art exhibitions. We’re honored to announce that we’ll participate Taiwan's largest art event "Art Taipei 2018 " for the first time this year. This exhibition will showcase contemporary sculptor artist Tsai Wei-Cheng, and present his works of the three series "Seventy-two" series (2018), "Sky" series (2016), and " Passional "series (2018). We’ll also present oil painting creations of Fu Tso-Hsin, Eastern Gouache creations of Chen Yi-Chia and Wang Po-Cheng 's ink creations. Fu’s works combine extremely delicate realistic elements with embossed oil paint texture in order to create a non-planar visual experience. Chen Yi-Chia’s paintings bring out indescribable family relationships and memories through the geometric image stacking. Wang's works are inspired by Buddhist thoughts and the philosophy. Rich Art Gallery will continue to expand and develop in the field of contemporary art, bringing a new era of contemporary and classic art.